Hello bloggers, wasn't Jen's project a great inspiration? If you didn't arrive here from Jen's blog, you don't want to miss what the whole DT has in store for you! 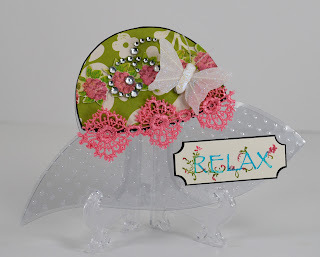 The Creative Cuts and More Blog Hop starts at Die-cut-diva! Also, if you get lost at some point, just hop on back to Die-cut-Diva and you will find the complete list of the blog hop participants, so you won't miss a thing. I am guest designing for Creative Cuts and More this month (yaaaaaaaaaaaaa!!!!) and during the blog hop, they are showcasing acrylic die cuts, so my projects today are going to use those. So, with that said, here is my first project. 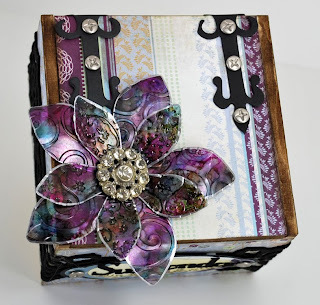 In this project I altered a box, that was a tea box my son gave Michael and I for Christmas and I saved it to alter. 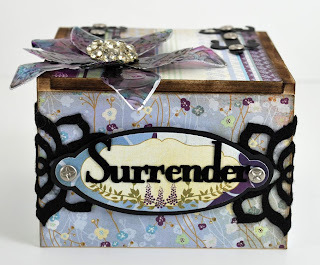 I have been wanting to make a box titled Surrender, which I read about in a book called Divine Intuition by Lynn Robinson, which I highly recommend to read! The idea behind the box is to write your issues down and place it in the box and surrender them to Universe. So this box has a great meaning to me. 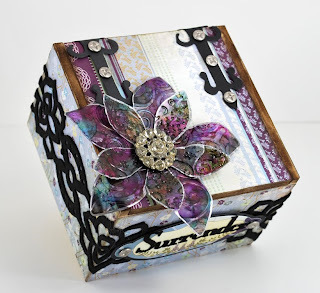 I used my Urban Anthology's June kit which contained the Wisteria line from Basic Grey and the acetate die cut flowers from Creative Cuts and More and these gorgeous huge hinges in black . And here is the box I created. Here is a close up of the flower, which I created by embossing with two different Cuttlebug embossing folders and painted it with Ranger alcohol inks and I painted the edges of the flowers with silver. I added a vintage gorgeous button in the middle. I love the way it turned out, and hope you do, too. And I have a sweet little card to share with you which used the cutest little die cut shape, a hat. For this card I used Urban Anthology's August kit products, Unity Stamp Co. stamp and the acetate hat from Creative Cuts and More. This card was again dry embossed with my Cuttlebug folder. Isn't this the sweetest little card???? I hope my projects inspire you and there are so many amazing die cuts offered by CC&M. You have seen me use quite a few of them in the past. I also love their killer red tacky tape for gluing their boxes, and they have the best price on those tapes! This week, for all of the BLOG HOPPERS they have a special discount for you! The code is acetatebloghop0809 and it is for 15% off and is good until Friday Aug 14th – you can use it at www.creativecutsandmore.com. They are even having a Blog Hop CANDY give away at www.diecutdiva.com. Terry is generously giving away their new Sealife 8x8 mini album kit to one lucky winner! The next blog to visit is Lindsay's and you don't want to miss out...wait till you see what she has to share with you!!!! Thank you for visiting my blog and have a fabulous blog hop!